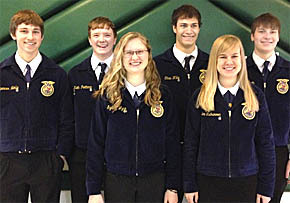 Boone Central FFA earned championships in three contests and had many state qualifiers in the Districts 7 Career Development Events held Tuesday, March 4, at Central Community College in Columbus. Students from 12 schools in District 7 vied for the top awards. Boone Central students earned first place finishes in three events – Agricultural Sales, Welding and Livestock Management. Individual champions were Catherine Weeder in Ag Sales and John Wagner in oxyacetylene welding. Details in the March 12 Albion News and Petersburg Press Print & E-Editions.